For the first couple and their children, Christmas would begin at seven in the morning, when all the children and their terrier would bound into their parents’ chamber to claim the gifts which filled each of their stockings. After a hearty Christmas breakfast, the family would move to the library, where the children’s larger gifts were set out on tables. The President reveled in the sheer joy on his younger children’s faces when the library doors were thrown open and all their newfound treasures were lain out before them, “like a materialized fairy land.” He wrote that it brought back memories for him of his own favorite childhood Christmases in Manhattan. Burnishing his environmental credentials, Roosevelt refused to display a Christmas tree in the White House, fearing that to do so would be sending the wrong message to the public and be fodder for his political opponents. In 1901, the Roosevelts’ first treeless Christmas in Washington passed uneventfully. In 1902, however, Roosevelt’s two youngest sons, Archie and Quentin, cut down a small tree on the White House grounds and smuggled it into the closet of the room where the family opened gifts. The boys hung gifts for their parents from the branches and enlisted the help of the staff electrician in decorating the tree with tiny lights wired to a switch outside the closet. On Christmas morning, while the family opened gifts, Archie surprised his family by opening the closet door and throwing the switch. Amused by his boys’ ingenuity, Teddy nevertheless took them to his friend and environmental advisor (and later the first Chief of the United States Forest Service), Gifford Pinchot, to explain to them the negative effects of killing trees for decorative use. To his surprise, Pinchot went into a lengthy explanation regarding how sometimes, cutting down some larger trees was in the best interests of forests, as it allowed a larger number of smaller young trees to receive the sunlight they need to flourish. While there is no public record of any other Christmas tree being displayed in the White House during Roosevelt’s presidency, a number of environmental acts and reforestation laws had been passed by the end of his term, and the public controversy over the use of live trees for decorative and traditional use had subsided for the time being. 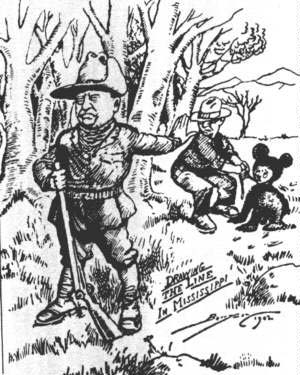 While on an expedition, President Roosevelt refused to kill a bear cub. A famous toy manufacturer received word of this story and created the teddy bear, which was a highly coveted toy during Christmas of 1902. 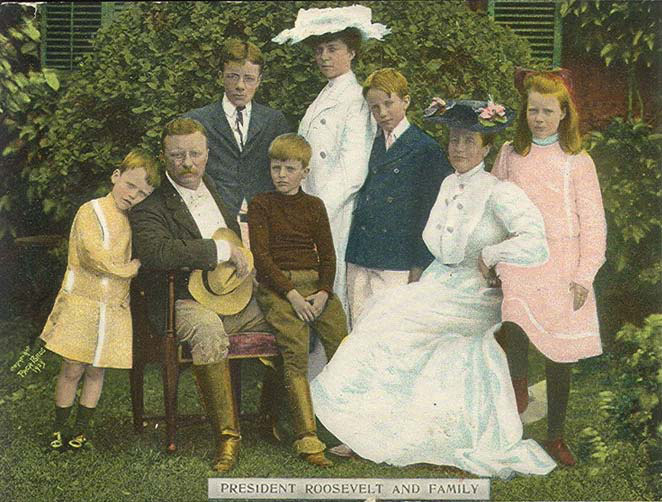 As a young man and also after leaving the presidency, Roosevelt and his family and friends spent a number of Christmases at the brood’s sprawling ranch in Medora, North Dakota. Their Christmas feasts and celebrations were renowned for their frivolity and for the prolific spread put out each year. Roosevelt was an avid hunter, and the meal would frequently include much of the game he and his friends had shot or trapped. He wrote of the thrill of the hunt in the weeks before Christmas and the pressure to not come back empty-handed on those excursions leading up to the big event. Among the dinner meats served were whitetail, blacktail and mule deer; moose, bison, antelope, suckling pig, jackrabbits, cottontail rabbits, wild turkeys, Canada geese, mallards, grouses, and his favorite, elk. Also included in the feasts were personally-distilled whiskeys, oysters on the half shell, olives, radishes, celery, consommé, chestnut dressing, giblet gravy, rhubarb-orange jam, spiced crab apples, mashed potatoes, spinach, onions in cream gravy, Brussels sprouts, tossed salad, mincemeat pie, vanilla ice cream, meringue, ginger snaps, Philadelphia sand tarts, nuts, fruits, chocolate dragees, coffee, and madeira wine. Dinner always took place at midnight, after everyone had worked up an appetite during a Christmas day full of rodeo events. Cowboys and cattlemen took part in the activities, which featured contests displaying skills in horsemanship, riflery, and archery. When not in Washington or North Dakota, the Roosevelts celebrated Christmas at Sagamore Hill, the family estate in Oyster Bay, Long Island. On Christmas Eve, the family would take a sleigh ride (later a motorcar ride) into town to Christ Church. After the pastor had delivered his sermon, T.R. would take the altar and deliver one of his well-renowned “sermonettes” in regards to the importance of Christmas. The mass would end with his favorite hymn, “Christmas by the Sea.” The following morning, presents would be opened and the entire clan would spend the day feasting, playing games, hiking and going on sleigh rides. For a number of years, Teddy dressed up as Santa Claus at the Cove Neck School in Oyster Bay, listening to the children’s wish lists and presenting them with gifts he had selected himself. Theodore Roosevelt was born on October 27, 1858 in New York City. His father was a wealthy merchant and his mother was a Georgian sympathetic to the Confederate cause. As a child, “Teddy” suffered from asthma and other ailments and he turned to boxing and rigorous exercise to build up his fitness. Before his 14th Christmas, he had traveled to Europe, Egypt, and Palestine with his family and was home-schooled, first by an aunt and then by a series of tutors. 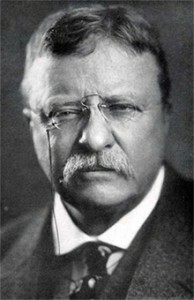 After graduating from Harvard University in 1880, Roosevelt entered Columbia Law School, but dropped out after one year to pursue a seat in the New York State Assembly. In 1882, at the age of 23, he became the youngest man ever elected to that position and quickly made a name for himself by fighting against corruption. In 1884, shortly after the tragic death of his first wife, Alice, he moved to the Dakota Territory and became a cattle rancher. It was here that Roosevelt first fell in love with the countryside and wilderness living and became deeply concerned about damage which industry was causing to the land and its wildlife. In 1886, his return to politics was thwarted when he lost a bid to become mayor of New York City. He then joined the U.S. Civil Service Commission and later became President of the New York City Board of Police Commissioners. In 1898, he was appointed Assistant Secretary of the Navy by President William McKinley. When the Spanish-American War broke out in 1898, Roosevelt founded the 1st Volunteer Cavalry, which became known as the Rough Riders. His charge up San Juan Hill during the Battle of Santiago (Cuba) made him the biggest war hero to emerge from the conflict. Upon his triumphant return shortly before Christmas 1898, Roosevelt was easily elected governor of New York. He went on to anger Republican Party bosses by cracking down on corrupt officials and enacting legislation which placed regulations on corporations. In 1900, in a desire to get Teddy off their backs, Republican insiders nominated him to be William McKinley’s Vice President, figuring he would have no real power. A year and half later, their move would backfire when tragedy struck as President McKinley was cut down by an assassin’s bullet. The man with the reputation as an ardent opponent of corruption and business excesses now held the highest office in the land. Just several weeks shy of his 43rd birthday, Roosevelt was the youngest man to ever become President. It was during his family’s first holiday season in the White House that he issued his initial Christmas tree ban. Almost immediately, T. R. set about transforming the public image of the presidency. He held public events at the White House, inviting the famed entertainers, athletes, writers and artists of the day. While on a hunting expedition, he famously refused to shoot a bear cub, spurring a toy manufacturer to create the teddy bear, a fad which became one of the hot-selling Christmas gifts in 1902 and still echoes to the current day. Roosevelt was a proud nationalist who believed in a strong chief executive and a powerful federal government. He used what he called the president’s “bully pulpit” to give speeches designed to sway public opinion in regards to the importance of regulating corporate trusts and not giving the largest businesses too much control over the direction of the national economy. T.R. also preached of the importance of the United States having a strong role in world politics and international affairs. A painting done of Teddy Roosevelt, wife Ethel, and all six children - the perfect gift to send out with their White House Christmas cards. In 1902, President Roosevelt managed to convince more conservative, pro-business members of the GOP to go along with a plan to create the Bureau of Corporations, which investigated businesses involved in interstate commerce. Teddy began enforcing the near-dormant Sherman Antitrust Act and broke up the Northern Securities Company, a huge railroad conglomerate. He continued his “trust busting” by filing similar suits 43 times over the next seven years. Clearly, the President was not high on the Christmas lists of these companies’ executives. He also intervened in the Anthracite Coal Strike, a dispute which could have led to the loss of heat for many thousands of U.S. citizens. Using public pressure, he convinced both sides to accept his mediation. When the strike ended with a modest pay hike for workers, Roosevelt spoke of his philosophy as promoting a “Square Deal” between the interests of business and labor, and it became his 1904 campaign slogan. Happy with his progressive policies, the American electorate handed T.R. a landslide victory in the 1904 Presidential Election over Democratic challenger Alton B. Parker. Spurred on by his public mandate, Roosevelt pushed Congress to allow the Interstate Commerce Commission to set railroad transit rates. The Hepburn Act of 1906 created the first federal regulatory agency. Also in 1906, the Pure Food and Drug Act and the Meat Inspection Act were passed to protect consumers from tainted products. With all his economic reforms, nature and all of its wonders was always nearest and dearest to President Roosevelt’s heart, and he used his newfound political clout to enact the most far-reaching and consequential environmental legislation in the nation’s history. He created the Forest Service in 1905 to directly manage government-owned forests. He designated public lands as national forests and made them off-limits to all commercial use. In total, Roosevelt set aside five times as much land as all of his predecessors, a total of 194 million acres. On foreign policy, President Roosevelt believed that America, which had risen to great-power status, should exert a more muscular, non-isolationist foreign policy. He was happy that that the U.S. had signaled an end to its previous isolationism when it took on the Philippines as a colony following the Spanish-American War in 1898. Roosevelt believed that more powerful “civilized” nations had a responsibility for the management and supervision of smaller, more “barbarous” ones. His motto on foreign policy was to “speak softly, but carry a big stick,” and he issued what came to be known as the Roosevelt Corollary to the Monroe Doctrine. This edict barred foreign powers from intervening in Latin America and stated that America would police the region, and guarantee that the countries would meet all international debts and obligations. Later, he backed up his words when he set up a U.S. military protectorate in Cuba. Before the holiday season in 1903, with the suggestion of American protection, he encouraged the secession of Panama from Columbia. He then signed an agreement with the new nation to build a canal linking the Atlantic and Pacific Oceans. Roosevelt considered the construction of the Panama Canal to be his greatest accomplishment as President. To this day, over 10% of U.S. and 5% of worldwide merchant shipping traverses the canal each day. 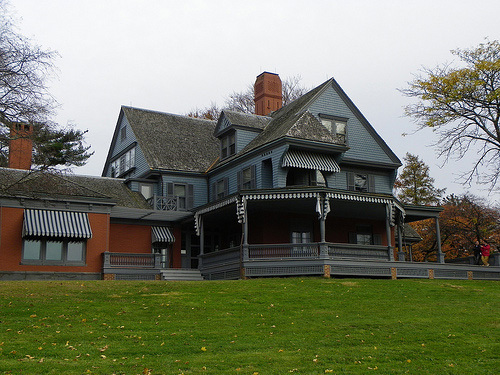 Sagamore Hill, the Long Island estate of Theodore Roosevelt, where he spent many Christmas holidays with his family before and after his two-termed presidency. From1904-1905 at the Portsmouth Peace Conference, President Roosevelt helped bring an end to the Russo-Japanese war through direct mediation between the two sides. For his efforts, he won the Nobel Peace Prize in 1906. Teddy wanted to construct a balance of power in Asia favorable to American interests. He didn’t want any one nation to become a regional superpower. In Europe, Roosevelt feared the outbreak of a general, large-scale war. He viewed U.S. and British interests as almost identical. While he publicly maintained the official position of American non-involvement in European affairs, he quietly instructed his envoys to support British and French interests (as opposed to German ones) at international conferences. After two terms, T.R. chose not to run in the 1909 election. He was happy to see his Secretary of War and hand-picked successor, William Howard Taft, assume the office. Roosevelt toured Europe and embarked on a ten month hunting safari in Africa. When he returned, he found that a rift had formed between his progressive supporters and Taft, who had moved somewhat rightward politically to appeal to the large conservative Republican faction. Due to both policy and personal differences with Taft, Teddy decided to seek the GOP nomination in 1912. When that effort failed due to inside politics, he formed the Bull Moose Party and ran in the general election. He campaigned on a progressive platform, proposing more government regulation of businesses and greater promotion of social welfare. While campaigning in Milwaukee, he was shot in the chest by a mentally ill man and was saved only by his steel eyeglass case and the long, folded-over speech in his breast pocket. These items deflected and slowed the bullet, but it still entered his body and traveled three inches along a rib. Roosevelt bolstered his intrepid reputation by refusing to be taken to the hospital until he had delivered the entire 90-minute speech. Despite this stalwart display, he and Taft split the Republican-leaning vote allowing Democrat Woodrow Wilson to win the presidency. Roosevelt’s Progressives elected few candidates to national office and the third party would soon fade into irrelevance. Still smarting from the election results, Roosevelt and a party including his son Kermit traveled to South America shortly before Christmas 1913. They embarked upon an expedition through the jungle and discovered the 600 mile River of Doubt (later renamed the Rio Roosevelt) in early 1914. During the trip, Teddy contracted malaria and suffered from an even more serious blood poisoning which occurred after a leg wound had become infected. The illness nearly killed him and he would be plagued by health issues periodically for his remaining years. When World War I broke out, Roosevelt became a fierce public advocate of the Allied cause. He was infuriated when President Wilson refused his offer to lead a division in France, and grief-stricken at the loss of his youngest son Quentin, who died in combat when his plane was shot down. All four of Teddy’s sons served in the war, with two others sustaining wounds. As World War I came to a close, he reconciled with both Taft and the Republican Party. There were early talks of him seeking the Republican nomination in 1920, but after returning from the hospital on Christmas 1918 following a bout of rheumatism, he died in his sleep from a blood clot on January 6, 1919 at the age of 60. Such an interesting man and symbol of the times. Teddy could also be considered the father of the environmentalist movement. Thank You to the publisher for this in depth article on Mr Roosevelt, I learned some things and have a new found respect for him. We should all live our lives with such determination and passion. Mr. Roosevelt was an amazing president. This was a complete back-round and informational piece. I might even say better than some encyclopedia entries I’ve read in my lifetime. Does anyone read those anymore?